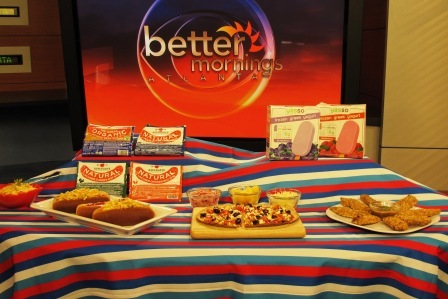 My appearance this morning on CBS Better Mornings Atlanta was sponsored by Applegate Farms. When you ask children what their favorite foods are, the top three are generally hot dogs, pizza and chicken nuggets. But these foods aren’t generally on the top of parent’s lists for what to feed their children. In a recent survey conducted on behalf of Applegate, 92% admitted buying hot dogs in the past year and 71% felt that they were not high quality. Furthermore, 34% said they wanted to say no when asked for hot dogs. It doesn’t have to be that way. There is a way to feel good about providing your child with some of his favorite choices by knowing what to look for in the store, reading labels, and getting a little creative in the kitchen. Not all hot dogs are created equal: Choose those that are lower in fat, don’t have added nitrites or nitrates and are lower in sodium. Applegate hot dogs do just that and then some. If you look at the label, there are just four simple ingredients and no antibiotics. Most importantly, they taste great! My four year old loves them. If beef isn’t your thing, then Applegate also makes chicken and turkey hot dogs. Add a whole grain bun, and your hot dog is a fiber and protein packed lunch or dinner. 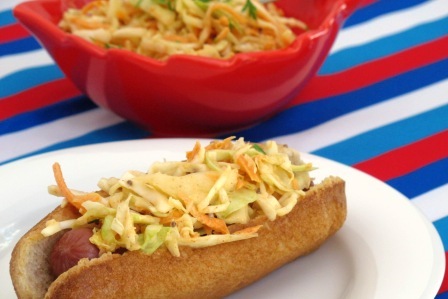 Have fun with toppings such as my Vidalia Onion Peach Relish or this delicious spin on a Chili Slaw Dog. This is a great way to get the smoky spicy flavor of chili in a slaw. Greek yogurt replaces most of the mayonnaise for a healthier take. It is a great side dish in addition to a hot dog topping. In a large bowl, combine shredded cabbage, carrot and onion. In a small bowl, whisk together the remaining ingredients. Pour over cabbage mixture and toss well to combine. Pizza Plus: From toppings (think chopped veggies) to bottom (whole wheat crust), pizza doesn’t have to be the fat and calorie buster parents think it is. Have a pizza bar night by putting out a variety of toppings and let each family member make their own. You can even incorporate a theme, such as Greek, Hawaiian or BBQ for a different spin on traditional toppings. Children love being in charge of deciding what goes on their food, so this is a great way to get them involved and you may just be surprised at what they choose. While I generally prefer making my own whole wheat pizza crust, sometimes it is nice to use something already prepared. 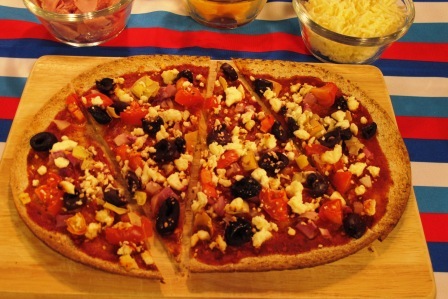 Flatout flatbreads make a great thin crust pizza. I used it with my pizza stone and it came out perfectly, though I hear it is great on the grill too. Here is my recipe for a quick homemade pizza sauce. This is a quick and easy homemade pizza sauce. In a small bowl, combine all ingredients, stirring well. Use as a pizza sauce on homemade or purchased pizza crust. 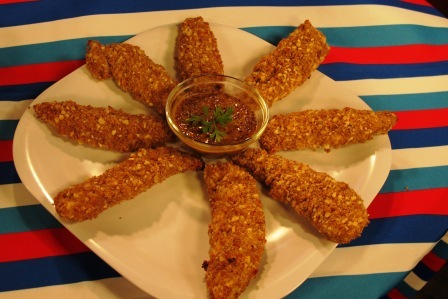 Nuggets of wisdom: Look for chicken tenders instead of nuggets, and bake instead of fry for a healthier alternative. Chicken tenders use the meat from the chicken breast so it is leaner than nuggets, which are made from various parts of the chicken. While Applegate also makes a frozen chicken tender that is very good, I also like to make my own. I created this Oven “Fried” Chicken recipe that works great for chicken tenders, or even smaller bite-sized pieces. My son loves helping make these. I can make a large batch and keep them in the freezer for quick meals. Ice Cream/Parents Scream: It’s certainly a summertime favorite, but ice cream is loaded with fat and calories. Consider ice milk or some of the newer varieties of Greek frozen yogurt. Not all are created equal though, so be sure to still read labels and avoid those with artificial colorings or other additives. Personally, I’m partial to Yasso frozen Greek yogurt bars. For a fun children’s activity, consider making your own frozen fruit puree pops with fresh fruit, yogurt or 100% juice. This is not a sponsored post, though my appearance this morning was sponsored by Applegate Farms. Any other brands mentioned are just those that my family and I enjoy.